Time sinks: high effort (lots of work to do)/low impact (low value or return on the time invested). Monitor the students (Teacher) – this time feels like an eternity unless you do a few laps around the room pretending to be an Olympic speed skater during a slow-motion replay (see more suggestions here). Distribute the graded test papers, answer questions (if any), get students to look through the answers again (just in case) (Teacher) – 20 minutes or more, depending on the results. Look through your test paper, see the mark, see what your peers got, get happy/unhappy, and forget about it (Students) – 2 minutes. Come home and do individual assignments to improve your performance (Students) – not on this planet. The time costs are immense while the impact seems to be much lower than expected. Meanwhile, this time could be used far more effectively to the end of better learning. In this post I will show how to do more by doing less and turn the whole process of testing into a fun high-impact activity for your learners. Distribute test papers. Get your students to prepare their “ladders”. I have already written about game-based assessment and the ladder game in the post THE REAL TRICK: TURNING A TEST INTO A GAME. There, you can also find a template of the ladder kindly designed by Tekhnologic. Note: It is important to make sure students use the same template of the ladder with the number of rungs corresponding to the number of questions in the test. Have the students write the test. You can have them complete the whole test (all tasks at once), or check immediately after they complete a task. Check the test a) with the whole group, or b) pair up students, or c) get students to work individually (for b and c options, you will need answer keys). 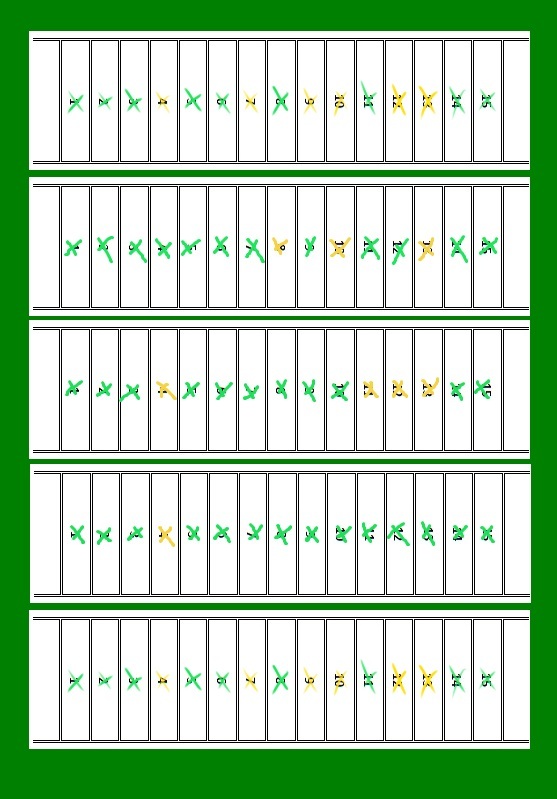 While checking (and discussing answers), get the students to cross out the squares in the ladder (green – for the correct answer; yellow – for the incorrect answer). You can additionally introduce the “doubt” colour, i.e. when the student just guessed the right answer. I’d suggest introducing this approach gradually – it might take some time for your students to get used to the idea that “tests are not designed by teachers to make students suffer”. For the same reason, I try to avoid the red pen. After all, we never fail tests, we just find ways to do them wrong. Ask the students to put their ladders together (they can either put them on the desk, or (a better option) stick them to the board). To make sure students do not experience any discomfort when displaying their results to the whole group, they are not required to write their names on the ladders. I usually ask my students to write their initials on the rungs (if they play the Ladder Game in pairs), or initials on the back side for me to design individual tasks for them. Voila, now we can see the overall picture of your group’s performance. Have a class feedback session: see which questions were most challenging. Plan a brief revision, if needed. Later on, you may study the results of individual students and create individual assignments for them. No papers to grade at home. No need to burn the midnight oil. Instant data showing both group and individual performance. Most importantly, students actively participate in the process, learning to assess their weaknesses and taking ownership of their own learning. Happy teaching and have a good summer holiday!